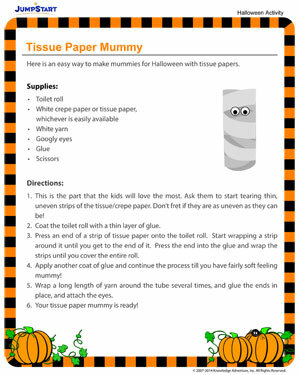 Let the spooky spirit loose this Halloween and scare away the evil spirits with this scary tissue paper mummy! It’s easy to make and requires very few supplies that are all easily available at home. So, sit the kids down on a lazy afternoon just before Halloween and have them make many of these spooky mummies to be kept at random corners in the house to ward away evil apparitions!